Based on a popular TV cartoon series, this game contains two interactive stories for children aged 5 to old mummy named “mulm og mørke” and “sol, sand og safier” (roughly translated to “dusk and darkness” and “Sun, Sand and Saphires”). 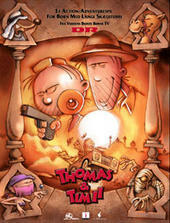 The games was released in christmas 1998 following the success of Thomas and Tim 1 the year before. Again developers used the original artwork used for the TV cartoon series as rendered backgrounds for the interactive story and created puzzleplay to extend the story.